Best View Pyramids i Giza, Egypten : Boka nu! Our boutique hotel offers the experience of a smaller friendlier more personalized stay, but with most of the high end facilities and ambience of the larger hotel chains. Recently opened and the newest accommodation in the famous pyramids area. 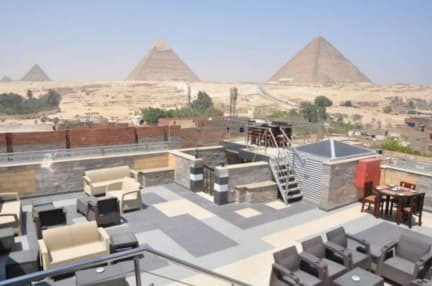 We are situated in a quieter area and have wonderful views of the pyramids from any of our amazing rooftop facilities. Guests are able to enjoy a meal, refreshments and/or smoke Shisha, in the cool evening breeze whilst watching the evening Sound and Light Show from the rooftop, truly an overwhelming experience. The rooftop areas are ideal for unwinding, meditating and taking in the whole atmosphere of this awesome part of the world. We are located in one of the best locations of the city, near to some of the finest attractions and landmarks of the area such as Orman Botanical Garden, Giza Pyramids, Prince Mohamed Ali Palace and Pharaonic Village. Furthermore, the city of Cairo is near to our facilities, so it is easy to reach El Cairo from our facilities as well.